Looking to kit yourself out with the best Apex Legends weapons? Then our handy weapons guide for Respawn’s battle royale will serve you well. 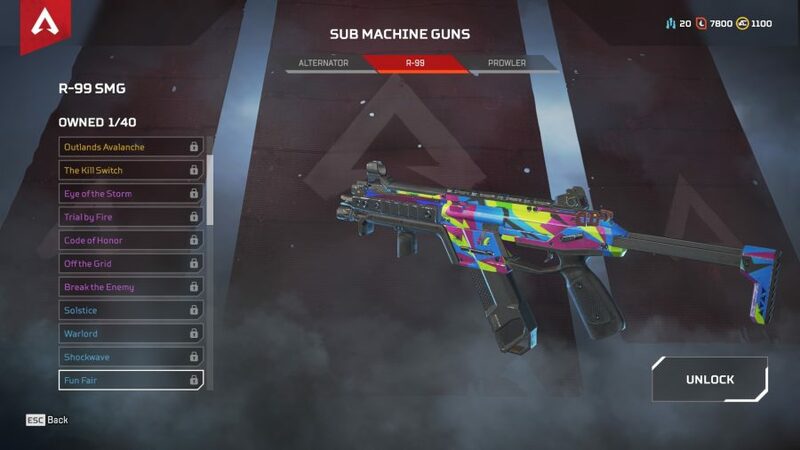 Apex Legends may host a smaller pool of players to the usual battle royale, with 60 players instead of 100, but you’ll still need a fine selection of modded guns to ensure that “you are the champion” screen rolls. As is usually the case with futuristic shooters, weapons are only vaguely recognisable. Sure, basic archetypes remain intact such as shotguns, snipers, and auto-rifles, but they come with unique quirks. For example, the Mozambique is a pistol that operates as a shotgun by firing a spread of shells. A mod can also transform the performance of a gun entirely. For example, SMG’s tend to have a smaller magazine size so an extended mag mod to boost that goes a long way in making this class of guns more viable. On top of that, there are more specific mods for key weapons, like the “Precision Choke” mod for the Peacekeeper shotgun that tightens the spread of your shot. To borrow some online lingo, you’ll “map” people. Guns also behave differently in Apex Legends to other battle royales. None of the Apex Legends weapons are hitscan, so you’ll need to factor in bullet-drop into your aiming when judging the distance between you and an enemy. Also, there’s no damage falloff across the board so you won’t need to worry about losing damage in rangier fights. Oh, and there are also six different archetypes with 19 Apex Legends weapons in total. But fear not as that’s where we come in. 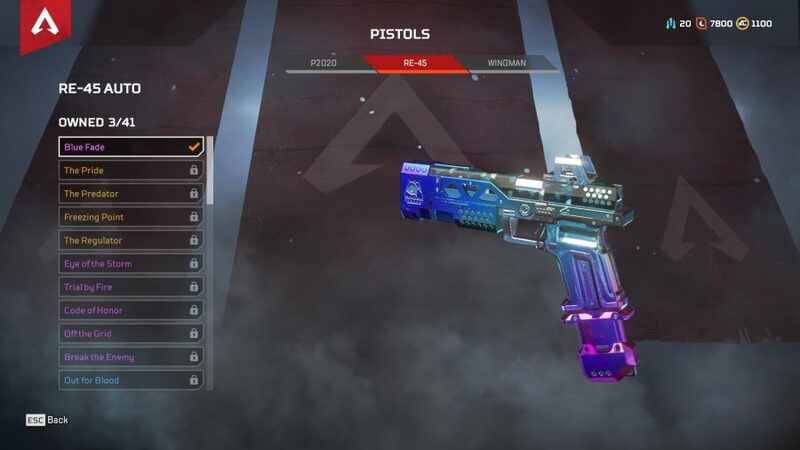 We’ve laid waste to many training dummies to bring you an Apex Legends weapons guide that dives into what makes every gun tick, what ammo you need, and what mods will best optimise their performance to ensure that you too can become a legend. The Flatline boasts the highest clip size of Apex Legend’s three auto-rifles with 20 bullets, and can fire in single and full-auto mode. Alongside some solid base damage with around 16 to the body and 32 to the head, this gun is well equipped straight out the box. That said, you can boost its performance with a mag, optic, or stock mod. The Hemlock provides the burst-fire option of the auto-rifles but can also be fired in a single shot if you press B on PC. It also has a slightly smaller clip size than the flatline with 18 rounds per mag. You can expect around 18 damage to the body and 32 to the head. In terms of mods you can kit it out with a barrel, mag, optic, or stock upgrades. While the Carbine may be the only assault-rifle to use light rounds, it shares some commonality with the Hemlock in holding a clip size of 18 rounds and with the Flatline in boasting the ability to fire in single or auto-fire. Damage-wise, however, it falls slightly short and does around 14 to the body and 28 to the head. It does, however, fire the quickest to compensate. Much like the Hemlock, you can boost this gun’s performance with barrel, mag, optic, and stock options. The Havoc has the potential to act as both a rapid-fire auto rifle and a sniper-rifle – all depending on what hop-up mod you have equipped. Fresh out the box, it’s fire-rate will gradually increase over time – making it act like an auto rifle. If you attach a Turbocharger that wind up time will be reduced. If you attach the Selectfire Receiver mod you can turn the Havoc into a single-shot weapon that has the personality of a sniper-rifle. The main perk of that mod of fire is that it’s hitscan – so you don’t have to factor in travel time and bullet drop. Aside from that, you can expect the Havoc energy rifle to do 18 damage to the body and 36 to the head. The Havoc can also be kitted out with Optic and Stock mods. 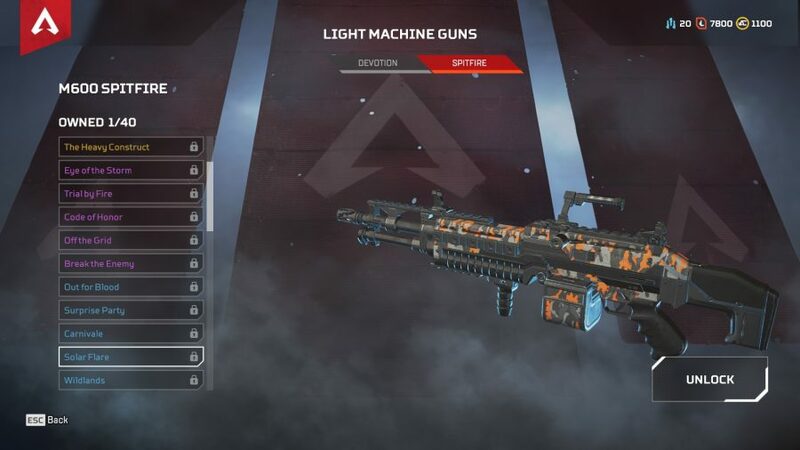 The Devotion may boast the higher ammo capacity of Apex Legend’s selection of Light Machine Guns with 44, but there is a slight trade-off as damage is 17 to the body and 34 to the head. That said, the gun does boast a higher fire rate to compensate, although it’ll need some time to wind up to full speed. Lucky, if you come across a Turbocharger mod then that wind-up time will be notably reduced. Apart from that, you can also rely upon barrel, optic, or stock mods. The Spitfire boasts better damage across the board with 20 to the body and 40 to the head. Naturally, this comes at a trade-off of 35 shots per magazine as opposed to the 44 rounds per ammo clip you’ll find with the Devotion. Unlike the Devotion, the Spitfire can only upgrade with the standard set of barrel, mag, optic and stock mods.In terms of damage per second, the Spitfire is the superior LMG, but stockpiling enough Heavy Rounds to make use of it can be tricky. A fairly bog-standard pistol, the P2020 is fine in the earlier game where nothing else is available but definitely something you’d want to avoid being stuck with late on. The gun holds a magazine size of 10 rounds and does 12 damage to the body and 18 to the head. While It does possess a fairly swift fire-rate to balance it out the mod options are also fairly meagre, with only mag and optic add-ons available. This quirky pistol is the only of its kind to be fully-automatic and as such feels like a proper sidearm. To make this kind of gun personality work it has the highest clip-size of the pistol family with 15, but the lowest body damage of 11 and lowest head damage of 16. It does have more mod potential than the P2020 with barrel, mag, and optic options, however. A true marksman’s treasure, the Wingman has proven a favourite among those who fancy themselves a good shot. It does boast the lowest clip-size and fire-rate of the all the pistols with six per magazine but can deal damage of 45 to the body and 90 to the head. Crikey. In terms of mods, it can also use the Skullpiercer mod – which boosts headshot damage beyond 90 – alongside mag and optic mods. 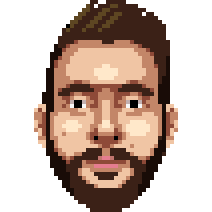 Just keep clickin’ on those heads and you’ll be fine. The EVA-8 is the fastest firing shotgun on offer in Apex Legends and is the only pure shotgun that comes in full-auto, which makes it the most forgiving if you don’t trust your aim. You’ll find eight shots in the EVA-8’s magazine and can expect it to do 63 damage to the body and 90 to the head – provided you can land every pellet. The shotgun’s performance can be enhanced with the magazine and optic mods. A real common sight in Apex Legends early-meta has been the Peacekeeper and for a good reason, too. With a damage output of 110 to the body and 150 to the head, it’s a reliable two-tap to kill. It can also use the “Precision Choke” mod to tighten the projective spread and make it more deadly at further ranges. It also holds six to the magazine and relies upon mag and optic mods to further boost performance. Half pistol, half shotgun, and entirely useless, the Mozambique is only handy early on. You can recognise it by its pistol appearance and because its spread is only made up of three bullets it’s surprisingly handy at distance. The Mozambique holds three slugs per round and will do 45 damage to the body and 66 to the head. If you want to give it some juice, a mag mod will make up for its relatively low clip size. 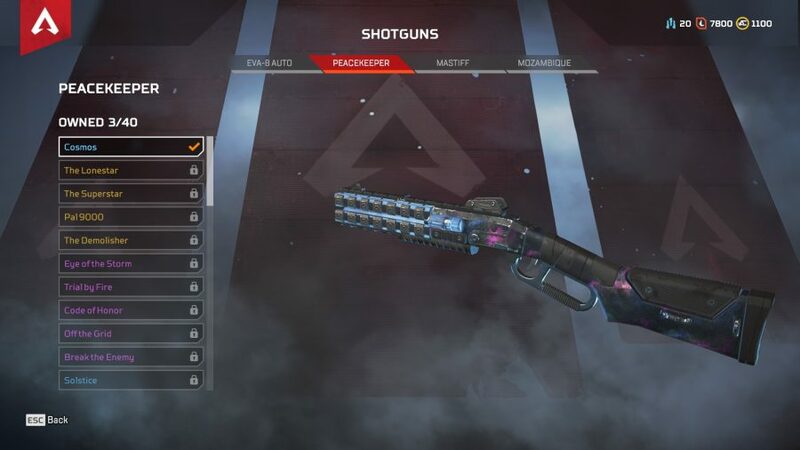 One of two Apex Legends legendary weapons, the Mastiff Shotgun can only be obtained by a drop, which will be marked on the map by three blue rings that ripple like water. The shotgun holds four to the magazine and can dish out 144 damage to the body and a whopping 288 to the head should your entire spread land. In case you were wondering, the maximum health a player can have is 200. As its damage alone will suggest, it’s worth the risk in trying to get your hands on one. A drawback, however, is that you can’t restock on ammo as its unique, meaning you’ll be stuck with the 20 shots the Mastiff comes with straight out of the box. Despite taking up a slot in Apex Legends’ sniper armoury, the G7 Scout does just what it says on the tin and operates like a scout rifle. As you may expect, this gun is the quickest firing of this group and also comes with the biggest ammo reserves with ten per magazine slot. You can expect damage of 30 to the body and 60 to the head and rely upon the barrel, mag, optic and stock mods to kit this gun out. You should be eying up a mag mod to counteract the weapons low ammo reserve and a mid-range scope to make spamming targets easier. A bit more sniper than the G7 but still more scout than the Triple Take and Kraber, the Longbow is a good middle point between fire-rate and damage. It holds five to the mag and deals 55 damage to the body and 110 damage to the head. What gives this gun some edge though is that it can use the skullpiercer mod, much like the Wingman. On top of that, you can also build the Longbow up with barrel, mag, optic, and stock mods to aid you in nailing plenty of crunching headshots with that skullpiercer mod. 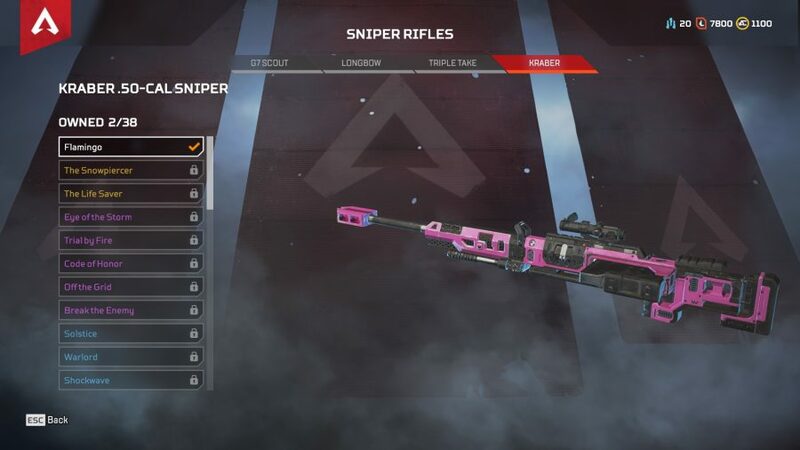 Another one of Apex Legends’ more quicker weapons, the Triple Take is a sniper rifle that fires off in three directions at once. It holds five in the mag and can deal 69 damage to the body and 132 to the head should you land all your shots. About that, you’ll want to pick up the “Precision Choke” mod for this gun to tighten up its three projectiles to make your life a lot easier. Past that, you can also add optic and stock mods to give this thing a bit more edge. 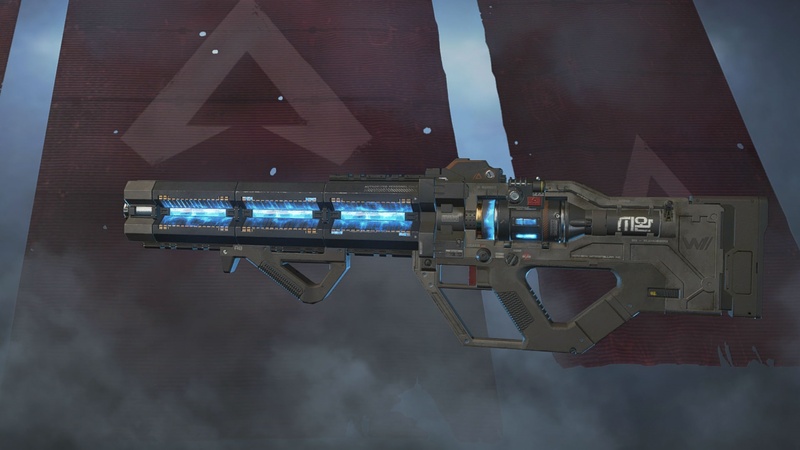 The second of Apex Legends’ legendary weapons, the Kraber holds a lot in common with the Mastiff. It’s powerful, but you won’t be able to replenish its ammo so you’ll be stuck with just the eight shots. While you can’t upgrade it with mods either, that doesn’t come into play as the sniper is fairly perfect just out of the box. Its scope can cover both six-times to eight-times in terms of distance and it can output 125 damage to the body and 250 to the head. Much like before, with a fully armoured foe having 200 health, the Kraber can put a real dent in any Legend. The Alternator is a real hard hitter and can deal damage of 13 to the body and 19 to the head. It’s downfall, however, is a relatively low magazine-size of 16. A mag mod is a must here but barrel, optic, and stock mods are also handy to buffing this SMG up. The R-99 has a much swifter fire-rate to the Alternator and can put out the damage of 12 to the body and 18 to the head. However, with a magazine-size of just two more at 18, the clip is again an issue. Much like the Alternator, keep your eyes peeled for mag mod alongside a barrel, optic, and stock attachment. With a mag mod and pinpoint accuracy, this SMG absolutely shreds. One of the more unpopular Apex Legends weapons, the Prowler offers a five burst-fire option among the SMG family. It does 14 damage to the body and 21 damage to the head while holding 18 to the magazine. True to form for the SMG family, it also benefits from a mag mod. One unique quirk it does have, however, is its ability to use the “Selectfire Receiver” mod, which allows it to fire in full-auto. Just remember that mag-mod. And there you have it, all of Apex Legends’ weapons detailed in full. Of course, personal preference will dictate what way you’ll sway toward, but this should give you something to think about. 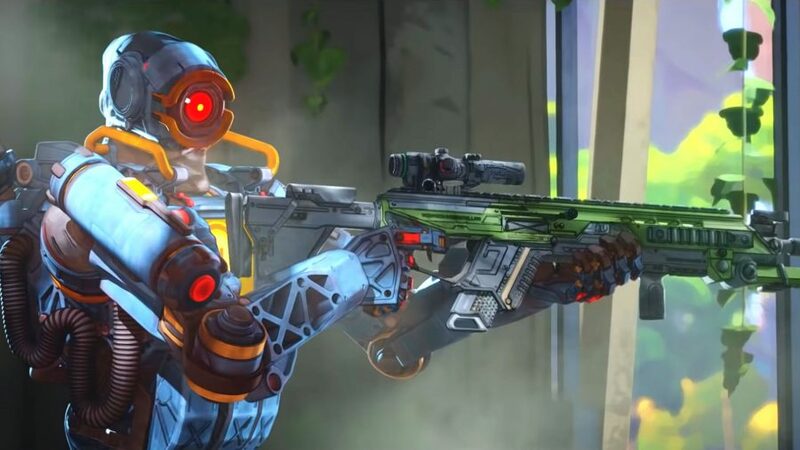 If you’re now thinking of what character to pair with your new favourite gun then our Apex Legends character guide would make for some good reading. If you’re more interested in some general Apex Legends tips then we have that covered, too. I find that pairing a fully modded Peacekeeper with Wraith’s invisibility perks proves to be very effective. Then again, anything with a Peacekeeper proves to be quite useful… unless your foe has a Mastiff.